This article on the Quartering Act in Colonial America provides fast facts and information about the effects of these laws and taxes. The Meaning and Definition of the Quartering Act: The Quartering Acts were two British Laws, passed by the Parliament of Great Britain 1765 and 1774, that were designed to force local colonial governments to provide provisions and housing to British soldiers stationed in the 13 Colonies of America. The 1765 Quartering Act made provisions for British troops to be given food and shelter at the expense of the American colonists. The 1774 Quartering Act was one of the series of Intolerable Acts passed as a reprisal to the Boston Tea Party. The history of the Quartering Acts is directly linked to the causes of the American Revolution. The Mutiny Act was passed just after the Glorious Revolution as was the 1689 English Bill of Rights. The Quartering Acts were extensions to the original 1686 Mutiny Act that, apart from dealing with mutiny in the British armed forces, also had clauses relating to standing armies and the billeting of British troops in barracks and public houses in the American colonies. The Quartering Acts were extensions of the original 1686 Mutiny Act. Read the 1774 Quartering Act text and words. The French Indian War (aka the Seven Years War 1754-1763)) was between France and Britain for possession of North America. During this time it is estimated that over 25,000 troops were sent from Britain to America. The British commanders, led by Lieutenant General Thomas Gage, had found it difficult to persuade some colonial assemblies to pay for the quartering and provisioning of troops, as required by law in the 1686 Mutiny Act. The majority of colonies had supplied quartering for British troops during the war, but the issue was disputed in peacetime. The French Indian War ended in victory for the British in 1763. Lieutenant General Thomas Gage reported the quartering problems he had encountered to the British Parliament. His experiences with uncooperative colonists was one of the issues that led to the Quartering Act of 1765. In April 1763, George Grenville became the British Prime Minister. Grenville needed to reduce the national debt. Before the French and Indian War the British national debt was only 72 million pounds. By the end of the French and Indian War January 1763, the debt had escalated to almost 130 million pounds. The cost of bringing the British army back to Britain could be avoided if the soldiers remained in the colonies - so the forces stayed in America as a standing army, through the provisions of the Quartering Act. The British victory in the French Indian Wars, saw the start of changes in the American colonies. The 13 colonies were looking to expand their territories to the west. The British had other ideas. The Proclamation of 1763 was designed to calm the fears of Native Indians by halting the westward expansion by colonists whilst expanding the lucrative fur trade. The introduction of the massive boundary, called the Proclamation Line, required the establishment, and the manning, of posts along the border - which the British administration argued was for the defence of the colonists and could be implemented through the Quartering Act. To pay the war debt the British ended their policy of Salutary Neglect in the colonies. They started to enforce the laws of the Navigations Acts and looked for ways of imposing new taxes in the colonies. If they were to collect the new taxes the British would needed a strong military presence to enforce the new measures - the Quartering Act would help them achieve this. 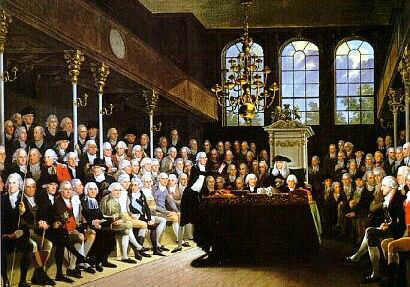 Peace in the colonies allowed the British to look for ways of gaining revenue from America and protecting British interests of the merchants in Britain. 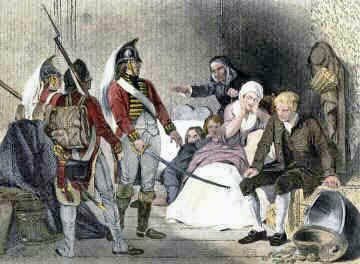 The concerns of the American colonists were growing with each change imposed by the British government in particular the Quartering Act as they believed that the British army could easily turn on the colonists. The year of 1765 saw even more British measures to increase revenue for Great Britain, which were to the detriment of the American colonists. The Quartering Act was one of these new measures and was passed on March 24, 1765. The British sent an additional 40,000 soldiers to the colonies in 1765 to protect the borders of the colonies and also to help to collect taxes from the colonists - it was a British show of force. The British believed that the colonies should foot the bill for British protection - hence the provisions of the 1765 Quartering Act. The Quartering Act of 1765 also required colonial governments to absorb the costs associated with quartering British troops which included food, shelter, bedding, cooking utensils, firewood, salt, vinegar, beer or cider and candles. The British announced the Stamp Act on 22 March 1765 that would take effect in the American colonies on November 1, 1765. The Stamp Act was passed by Parliament at virtually the same time as the Quartering Act. The Stamp Act placed a stamp duty (tax) on legal papers, newspapers and pamphlets. Vehement opposition by the Colonies, led by patriots such as Patrick Henry and Samuel Adams resulted in the establishment of a secret organization called the Sons of Liberty in July 1765 and the cry of "No taxation without representation" rang loudly in the colonies. 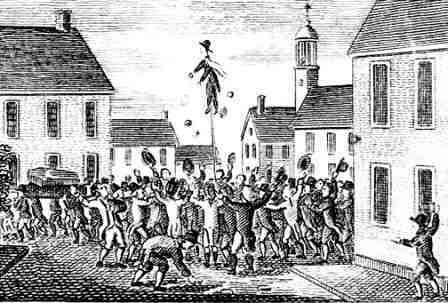 The violent protests led by the agitators led to the repeal of the Stamp Act in 1766. The Sons of Liberty organizations had started in Boston and New York quickly followed suit. The colonists were becoming more and more agitated by the new laws and the British presence in America. The Province of New York made a stand against the 1765 Quartering Act. The assembly of the Province of New York had passed a law to provide for the quartering of British troops but this had expired. The Province of New York had no intention to provide quartering for British soldiers during peacetime. In 1766 1,500 British troops arrived at New York City. The New York Provincial Assembly remained defiant until 1771 when they finally allocated funds for the quartering of the British troops. The British believed that their measures against the Province of New York would deter any of the other colonies from making a similar stand to the Quartering Act, or any other laws. The British troops in the American colonies were no longer there to fight a war - the soldiers were being used to enforce even more laws and the collection of new taxes in the colonies. The 1767 Townshend Acts were passed that set new import taxes on British goods including paint, paper, lead, glass and tea - the revenues would help to maintain British troops in America, with the help of the 1765 Quartering Act. British troops had been quartered in Boston since 1768 following protests prompted by the Townshend Acts. The posting of the British redcoats to Boston had been ordered due to the civil unrest in the city. The Boston Massacre was the climax of a series of brawls in which gangs of local workers and sailors clashed with British soldiers quartered in Boston, due to the provisions of the Quartering Act. The story of the Boston Massacre were widely publicized, it contributed to the unpopularity of the British regime in America and played a major part in the events that led to the American Revolution including the 1773 Tea Act which led to the Boston Tea Party on December 16, 1774. The Boston Tea Party was a direct protest by colonists in Boston against the Tea Tax that had been imposed by the British government. The British Government were furious and decided that Boston had to be punished and the Quartering Act of 1774 was passed. The Quartering Act of 1774 made no changes to the clauses in the 1765 Quartering Act but they made an addition to the Act. The Quartering Act of 1774 gave the governor, rather than the assembly, the authority to enforce necessary arrangements to ensure that the British troops were sheltered. This was designed to avoid a repetition of the defiant actions taken by the Province of New York, who had at one point refused to comply with the 1765 Quartering Act, and ensure that the Governor, not the colonists, had control of Boston. The 1774 Quartering Act is included in the series of British Laws commonly known as the Intolerable Acts. The other British measures that were classed as the Intolerable Acts were the Administration of Justice Act, the Boston Port Act, the Massachusetts Government Act and the Quebec Act. 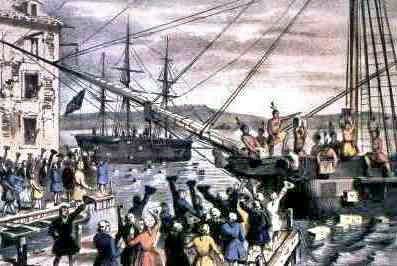 Less than a year following the Quartering Act of 1774 the American Revolution erupted. The Intolerable Acts of 1774 led to the First Continental Congress on October 14, 1774. The British refusal to repeal the Intolerable Acts led to the establishment of Continental Association and trade embargos with Great Britain. The American Revolution followed. Discover interesting facts and information about the Taxes in the 13 Colonies, including the Quartering Act, which was imposed on the colonists of Colonial America by the British government via parliament. The Quartering Acts are highly relevant to the events that led to the America Revolution.